I've tasted different types of coconut juice before, but never roasted coconut so I wasn't sure what to expect from this juice drink. One thing that stood out in the ingredients was 'coconut pulp', which generally makes for a chewy drink with little bits of coconut floating around in it. I do rather like these little bits of coconut, which is strange in itself, as I'm not usually keen on bits in my drinks. I don't even like over gloopy smoothies. On opening the can there was a roasted nutty smell with the usual sweet coconut. On pouring the almost transparent still liquid there was indeed lots of diced pieces of coconut bobbing around my glass. Instead of being white though these coconut pieces had a slightly cooked look about them and were a little more chewy than usual, but nothing uncomfortable on my old teeth. The drink was sweet and only tasted slightly roasted, mainly of sweet coconut with the pleasurable chewy bits at the end of each mouthful. 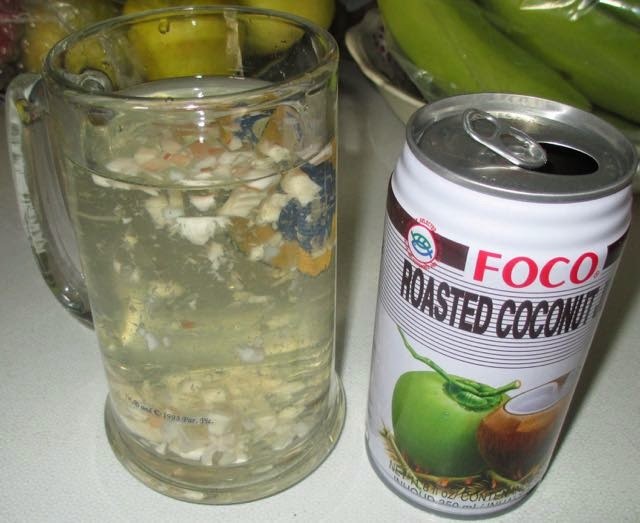 I'd say this Roasted Coconut Juice is a must if you want a sweet liquid pudding after a heavy spicy meal. Made in Thailand by Foco. 350ml can, per 100ml has 40 calories with 0.4g of fat and 9g of sugar. Ingredients included; roasted coconut juice (80%), water, coconut pulp, sugar, and citric acid.